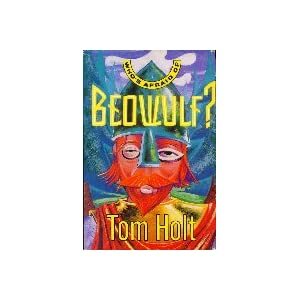 Tom Holt’s Who’s Afraid of Beowulf? is a silly caper story involving a hidden cache of Norsemen, an archaeology graduate student, and their journey together through Britain while trying not to gather too much attention — and failing. It’s a story that reminds me of Terry Pratchett’s DiscWorld books, which means that it was an entertaining read involving quirky characters and a kooky plot. This is a good thing. The entire thing starts with the discovery of a Norse ship uncovered by a construction crew in Scotland. A rather naive grad student, Hildy Frederiksen, is sent to check it out. She’s excited to see that the boat is a complete specimen, goes back to her hotel, and then gets the urge to return to the mound. Once there, she discovers the crew of the boat awake and walking around, which they most certainly should not be doing, having been buried there for twelve hundred years. The crew really is a well-honed battle group whose slumber has been in place merely until the time is right to prevent a particularly bad person from doing … well, something particularly bad. Hildy takes on the responsibility of finding food and clothing for the men, as well as shuttling them around and getting them acquainted with the modern world. This last task, surprisingly, isn’t as hard as it would seem. The Norsemen take modern technology in stride, thinking it the same as their magic; most likely it is, seeing as they have brooches they connect to electrically-charged chthonic spirits to make things happen. Mixed in here is the story of Danny Bennett, a fluff-piece reporter who earnestly wishes to write something more substantial. He stumbles on the Norse gentlemen, and his future gets entwined with theirs. Also making an appearance is the enemy’s guy Friday, whose experiences help to fill in a little back story (and provides for some nail-biting). I think this book is really quite good. The writing is light, pulling just short of treating the plot as inconsequential. Holt manages to give us a full story with some endearing characters experiencing something very surreal without it feeling like a fairy tale, which is nice. The end feels as realistic as possible for a fantasy tale; things aren’t perfect, but they turn up good at the end. A couple of things were a little off with the book, though. I didn’t quite get why we needed the chthonic spirits (other than to give the plot something to turn on). If they’re basically little living batteries, why can’t they use batteries when they discover them missing? They managed to do that with the other brooch, so that was a little confusing. I also felt like the book was a little light on substance. It’s one thing to have a breezy feel. It’s quite another to whisk the reader by points before they get a chance to sink in. A slightly slower pace would have made Who’s Afraid of Beowulf? a little better. The last problem I have with the book is that, without an interest in Norse history and literature, you might be a little lost during some sections of the book. Sure, the person might know “Viking”, but I’m not sure how many know the mythology, the Eddas, and the sagas well enough to pull out some of the more interesting bits of the story. Overall, though, Holt put together a delightfully humorous story about Norsemen in modern-day Britain. This makes him okay in my book. Looking Backward is not a book that was on my reading list. I had a book lined up to read, and then realized that I wouldn’t get through it, or, worse, finish it and not be fair to it. I found myself in a rare situation — I was without a book, and I needed something before I went to the gym the next morning, before the library opened. Luckily, my fiancé had a book from one of his college classes he thought I might like. He handed me Looking Backward, and I’m glad he did. It’s an interesting piece of speculative fiction with a Utopian bent. Bellamy starts off his book in 1887, telling the story of Julian West, a resident of Boston, in the first person. He talks about his life as a young man of the upper class, building a house and preparing for marriage. One night, he goes home and heads down to the basement chamber he’s created for sleep when insomnia is affecting him. He manages to fall asleep, only to find his chamber opened from above and strange people looking at him. It turns out West has been asleep for over one hundred years. Dr. Leete, his wife, and his daughter, Edith, have stumbled upon his room after digging for a construction project. West originally expects that what Dr. Leete tells him about the date is a joke, but slowly comes to understand that his Boston is gone and that a new one is in its place. What follows from here is a long exposition on what a socialist utopia would be like. It was fascinating in the extreme to read what Bellamy planned for almost all aspects of life for future residents of the world. He had an educational system worked out, a political system set up, international relations figured out, employment was straightened out, and even the (somewhat) equal sharing of labor between the sexes. He thought of almost everything. I found it especially intriguing that Bellamy had thought of some things that have come to pass. He had a credit card system that, while it had more of a chit feature than the magnetic strip we use today, functioned in a similar way to our debit cards. He also had a radio system with published guides that sounded to me like a mix of our radio and television system. It’s neat that he hit some things right from so far back. There were two things about the book that I disliked. The first was the tendency for Dr. Leete’s dialogue to become paragraph-upon-paragraph description of his own time and criticism of the past. No actual person, besides college professors, gets to talk at people like that. The whole point of something being a conversation is that there’s at least two people involved. As a result, the book is very noticeably a piece of hopeful propaganda. The second thing I didn’t like was the development of the relationships between the Leetes, and Edith in particular, and West. It did not feel organic, most likely because they were constructed in order to provide some sort of plot to create a vehicle for the political views Bellamy held. A more solid fiction would have made it a more compelling and interesting read from a pleasure standpoint. Overall, I thought Looking Backward was a neat piece of history. I liked being able to see what people in the Progressive Era were thinking about their society. I learned a lot, and I am thus grateful to my fiancé for lending it to me. I almost can’t wait until I run out of reading material again to see what he turns up. If there’s one thing I’m a sucker for, it’s a good alternate-history piece of speculative fiction. There’s nothing like the navel-gazing pleasure a lot of these stories provide. So what could be better than a book that posits that there are people out there creating new realities and new histories all the time? As The End of Eternity proves, not a whole heck of a lot. The story follows Andrew Harlan, a man who is responsible for making some of the changes in the flow of time in Reality. He and all the other people who work to perform these changes live in what is called Eternity, an outside-time location. Here people (mostly men) are trained from puberty to study Reality culture, preserve artifacts, decide on how to alter Reality, calculate Changes, and make those Changes. Harlan is a Technician, which makes him one of the detested and feared group that actually makes the final decision and makes the Change. Harlan is an isolated and lonely person. His few interpersonal relationships are solely work-related — his first boss, whom he detests; the esteemed elder who takes him under his wing; the trainee he tutors in Primitive (pre-27th-century) history. He has no family. No Eternal does. They give them up when they start training, and are never allowed to go back. Thus, when Harlan is introduced to Noÿs, a (gasp!) woman working as a secretary for his former supervisor, he does not understand how his feelings of attraction are supposed to work. He attempts to suppress them, but fails when he is sent to her time in Reality to do more study before a planned Change. This is not surprising, seeing as he was sent to stay with her. His infatuation leads him to take some drastic actions. I’m not going to outline them here; that would ruin the surprise. I will say, though, that the ending is not what I suspected, and shows, I think, a rather more nuanced view of the importance of the individual in relation to concerns for the overall good. I had my misgivings about Asimov when I read I, Robot a couple of months back, and I hesitated in requesting this book by him through inter-library loan. This, however, is worth it. Rather than a woman who is overly emotional, Noÿs is feminine but also competent. She is a rarity in the Eternal world, but is, from the start, capable of being both openly loving and intellectually capable — in other words, she’s like most actual women. Harlan responds to this, and does some interesting things in response. He is a good study in the book-smart, experience-dumb bookworms and nerds that exist in sufficient numbers for them to have been a tried and true group for the last century, at least. While Noÿs’ reactions are real, his are artificial at first. He can’t trust them, and has to grow through the emotional atrophy his training and occupation impose. While his decisions, at times, seem to be overreactions, they show that Asimov understood that men are just as capable of letting their emotions get the best of them. This is a fantastic exploration of both reality and relationships. It made me surprised every time I looked up at the clock — how could another hour have gone by? That’s the measure of a good book.